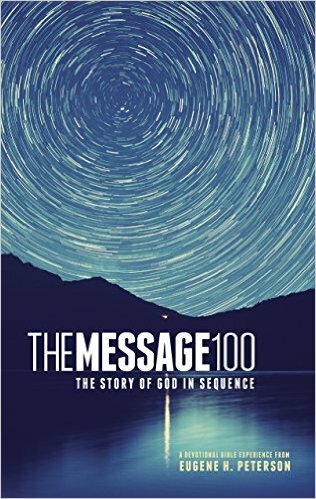 The Message 100 Devotional Bible: The Story of God in Sequence is a devotional of the Bible in unbroken timeline sequence broken up into 100 devotions. It is written to go at your own pace even though it is laid out into 100 readings. Although it is called a devotional, it has The Message Bible in its entirety. I love the feel of the cover of this book. I like the introductions. The introductions are short and sweet yet add to the reading. The “bibliography” section in the back is a great reference of the introductions, reading topics and where to find the biblical books. The overall layout is nice and organized. I like how each reading has the entire scripture instead of just references. I personally do not use The Message as my main Bible translation but I use it in comparison when studying. If you like The Message Bible this devotional is for you. Reading this book in 100 days would be a good challenge.